Oklahoma Connection | Young was born and raised in Stillwater, Oklahoma. 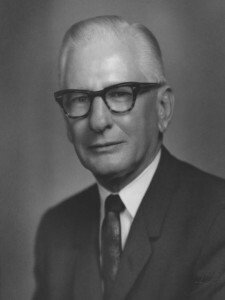 Raymond Young was honored as the “Outstanding Citizen of Oklahoma City” in 1966, and is a member of the Oklahoma State University’s Hall of Fame in its College of Business. Better known for being the “Y” of TG&Y department store fame, Raymond A. Young was born in Stillwater, Oklahoma, and attended North Star Grade School and Prep School, a former part of Oklahoma State University, before graduating from OSU in 1924. He was the high school principal at Mountain View, worked at the University of Oklahoma Extension Division, and was a teacher at Fogerty Junior High School in Guthrie in 1925. In 1926, he went to work for the Kress Company in Colorado and shortly returned to Pauls Valley, Oklahoma to partner in the opening of his first retail store. He became the sole owner of his second store, R.A. Young Co., in Kingfisher in 1928, and opened seven more stores around Oklahoma. He came to Oklahoma City in 1936, and partnered with R.E. Tomlinson and E.L. Gosselin to open the first TG&Y store in Norman and then at 23rd and Walker in Oklahoma City. At the height of its success, the chain of stores operated in 29 states and brought in annual sales of nearly $2 billion. Among his many civic activities, he worked tirelessly on behalf of the National Cowboy and Western Heritage Museum, Baptist Medical Center, OSU, and the YMCA. See pictures of Raymond A. Young and other media HERE.